Apple's earnings juggernaut has shown no signs of slowing in the post-Steve Jobs era, with the company posting record iPhone and iPad sales. Cupertino says Q1 2012 was its best quarter ever in terms of revenue, bringing in $46.33 billion (£29.7bn) with profits of $13.06 billion (£8.37bn). Apple also announced earnings of $13.87 per share, smashing Wall Street estimates of $10.06 out of the park. However, the biggest story of Tim Cook's first quarter in charge of the company is the all-time record iPhone sales of 37.04 million - up 128 per cent on the corresponding period last year. iPad sales followed suit, up 111 per cent to 15.43 million, while Mac sales were up 26 per cent on last year and totalled 5.2 million. The only blot on the landscape was another fall for iPod sales as they slipped 21 per cent year-on-year, but still added up to an enviable 15.4 million. 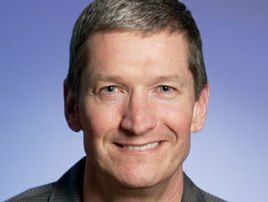 An understandably delighted CEO Tim Cook said: "We're thrilled with our outstanding results and record-breaking sales of iPhones, iPads and Macs. "Apple's momentum is incredibly strong, and we have some amazing new products in the pipeline." The company announced that it now has $97 billion stockpiled in cash as it closes in on Exxon Mobil as the most valuable company in the world once again.